There is a certain rhythm to making. 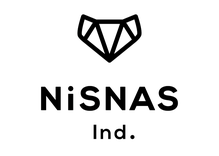 For us at Nisnas Industries it often feels like we're chasing one new product after the next without taking a second to stop and notice the impact of what we're doing. This can be a bit straining (but always challenging and fun, don't get me wrong :) ) For this purpose we decided to bring back the long form blog. This blog tat we started way back when we were in the cave in Wadi Nisnas gives a narrative form to our making experience and puts a spotlight on the process instead of the product. Alright, so the past few months have been a bit of a wild ride with the new tumblers coming online and lots of work on new bags and some ideas for a new planter that Max and I are calling the Spod (for now). We're a mile a minute and yes, it's just the two of us here as usual. The idea for the Honey Oak Tumbler came about like all good things, by chance, it was an idea that was thrown around a lot over the years and we didn't expect to actually make it till we actually did :). Max and I had seen a tumbler on Kickstarter years ago that tanked because it was too porous and the wood failed because oak is a very porous wood indeed. 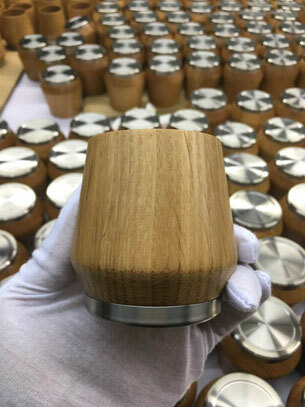 I can say that it formed the inspiration for our tumbler but the thought did stick in our minds, so how do you get a great wood tumbler to work without having it leak. We saw folks who used fire to char the inside but that doesnt actually seal but rather just give a darker taste. We needed to rething the complete idea and specifically the finish. The tumblers needed to be more than the sum of their parts, the bottom piece was directly taken from an Upper Cut flask then reworked with a new logo on the bottom of it and slightly better fittings. The bottom stainless part was also a barrier in cade the tumbler did leak out. The wood we made for the prototypes was very porous and originally was quite chubby at the base, if you can imagine a chubby tumbler, that's what we had. It didn't work with the aesthetic we needed. We rethought and reworked the model till it was slim enough for the elegant feel we were going for. More importantly since we were insistent on the highest quality of oak, we could only get our hand on a fairly narrow stalk. We settled on a shape that was narrow and curvy that suited us and did the job well for the final customer. It was beautiful. The shape really is everything, iit is the message we send to our customers and more importantly, it is the shape that activated the whiskey, it is everything and it couldn't be chubby...We tested it with friends and reworked the design after taste tests but one problem persistent. The oak wood, left to it's own devices will slowly leak and any liquid left over night will make its way out through the long fibers of the wood. We needed a better sealant, one that would make a difference but that would also add to the design. After some intense testing and later testing with our kickstarter backers we decided on one type of wax we made in house (literally in a large pot :) ) and it not only did the job, it made the tumbler amazing. The was sealed the tumbler extremely well and give a slight oaky honey tone that also gave the tumbler its name- the Oak Honey Tumbler. Ta Da ! The Oak Honey Tumbler was born. The response for the wax we made was so great that we decided to make it available for anyone who needed to seal wood and have a great natural aroma of honey at the same time. So guess what, you can grab one from our site now. We're sending the tumblers out to our backer in a couple of week so we'll do a blog post on that and perhaps one more on shipping and the amazing challenge that it is.